Elizabeth Buffalo, professor of physiology and biophysics, looks at the neural dynamics at work in learning and remembering. 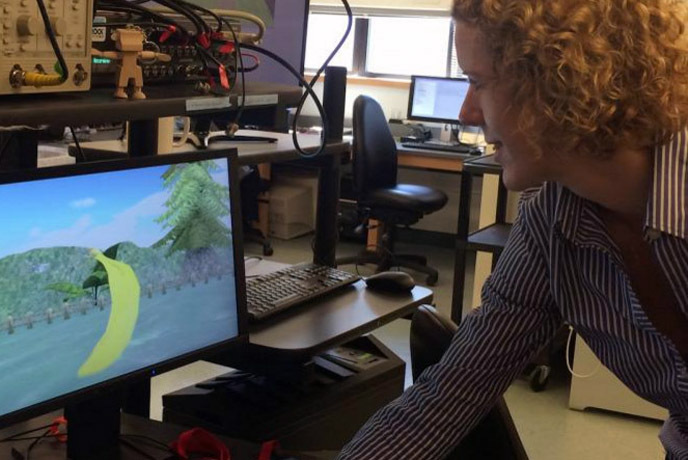 Neuroscientist Beth Buffalo plays a banana search game designed to test cognitive functions. Research on the formation and neural dynamics of brain areas critical to memory and cognition has earned a McKnight Endowment Fund for Neurosciences award for a UW Medicine neuroscientist, Beth Buffalo. Hers is one of four laboratories in the country to receive this year’s Memory and Cognitive Disorders Awards. According to the award committee, all of this year’s projects are examining how our brains respond to and are influenced by our environments. The McKnight Foundation is providing $1.2 million in total for the four awardees, with each project receiving $300,000 between 2018 and 2020. The awards encourage collaboration between basic and clinical neurosciences to translate scientific discoveries about the brain and nervous system into diagnostic and therapeutic advances for diseases such as Alzheimer’s, autism, and post-traumatic stress disorder. Buffalo is a professor of physiology and biophysics at the University of Washington at the University of Washington School of Medicine. She is also chief of the Neurosciences Division at the Washington National Primate Center. Her project will be, “Neural Dynamics of Memory and Cognition in the Primate Hippocampal Formation.” The hippocampus is a small area of the brain associated with storing memories and with navigating, such as finding your way home. It is part of the limbic system, which plays a role in emotional responses as well. Looking at past work in her lab, among the structures of the brain that intrigue the researchers are those that help recall events and facts. This part of the brain seems to be affected early on in Alzheimer’s disease. The lab is interested in how these structures act as a system in forming memories and in recalling them. The researchers have also been studying neural signals that are generated during memory tasks. The hope is that these will reveal memory mechanisms and ways of measuring them that could be further explored for developing clinical applications. Her lab is also noted for its discoveries on how parts of the brain that store and retrieve memory carry signals that are locked to eye movements and visual stimuli. For example, certain brain cells in these areas when the eye is looking. This neural activity seems to differ depending on whether the view seems familiar, and therefore might indicate if what is being seen is remembered or not. One of the questions the lab is asking is, How do such representations of eye movements pertain to memory functions in the hippocampal formation? In other developments, the lab has been measuring how normal aging causes declines in working memory and long-term memory, as well as some other cognitive deficits. These measurements are made during the performance of memory tasks. Such studies might prove helpful in providing ways to check for subtle, impending difficulties before they become more apparent. They might also become useful in testing candidate medications for stalling the onset of memory problems in older people or for alleviating some of the symptoms. The McKnight Award will expand the research direction of the Buffalo lab in furthering knowledge on the biology of memory.